Abbreviated DPR or just PR, the daily production report might be the most important documents a producer looks at every day. From video agencies to indie productions, having a up-to-date DPR is necessary for assessing progress, catching inefficiencies, and tracking each production daily expense. In our post, we cover the process with our free production report template and step-by-step guide. What is a daily production report? Who handles the daily production report? What is the purpose of a daily production report? If you have your own production report template, some elements may appear in a different order. The important thing is that they all share similar elements. There is no absolute standard daily production report format in Excel, Word, Numbers, etc. Because daily production reports can be different, make sure the 1st AD, UPD/line producer, and producer all approve your daily production report template prior to the start of production. A polished daily production report also serves as a legal document of what took place on set that day. This is especially important for bigger films that require oversight. The most complicated part of filling out a daily production report is knowing where to find all the information. We’ll go through that step-by-step below. Production Office: Include the company name, address, phone and fax numbers. Project: The title of the project. For TV / series, include the episode number and title. Date: The shooting date for which you’re filling out this PR. Shoot Day: If you’re shooting thirty days, which of those days is this one? Start/End Date: The start and estimated end date of the shoot. In the provided production report template, you’ll have a place to record the day's call times. Crew Call: The time the crew arrives to set. You’ll find this on the call sheet. Shoot Call: The time when talent reports to set to begin shooting. Meal In/Out: When meal breaks officially begin and end. Crew Wrap: After the crew has wrapped up gear and put everything away. Last Man: The time when the very last person walked off set for the day. Locations: Fill in the street address of each location you shot today. Production Crew: The names and contacts for lead crew who worked today. Generally, you can find location and production crew details on the day's call sheet. Very few productions use film stock anymore. But hard drives and camera cards are still expensive. So you have to keep track of media usage. In this production report template, the section is all about digital media since that’s what most productions use these days. # of Cards Used: The total number of cards that were used today. Previously Shot (GB): The useful number to put here is not how many cards were used, but how much data (in Gigabytes) has been used since the start of the shoot. Get this number from the previous day’s production report. Shot Today (GB): Calculate how much data (in Gigabytes) was shot today. Total to Date (GB): Sum up the last two figures together. This calculates the total amount of computer storage that the production has used so far. This will help production anticipate hard drive and backup storage requirements for the rest of production. You can usually get media details from the Data Wrangler / DIT or the Script Supervisor's daily production report (not to be confused with a producer's daily production report). Card Number: List all the data card numbers used by your camera department today. Footage Description: Describe what footage they recorded to that card. Include the capacity (gigabytes) of the card in the description and if you filled the card to capacity. Audio Notes: Fill in any information relevant to your editor about sound. Was sound properly synced? Were the takes numbered properly? Did you miss a slate on take 3? That all goes here. If you have any questions, check in with your sound and camera team. If your camera department used special equipment, or if crew had trouble getting something to work, this is where it’s formally communicated to production. Ask the camera department, Best Boy Grip, and Best Boy Electric for any notes they may want you to include in the daily production report. At the bottom of the first part of the production report template you’ll find a list of all the major crew or talent whose times you need to track. You should customize this section of the template to match your production’s needs. Position: The crew position or talent’s role. Name: The name of the crew member or talent. Travel: If the production needs to account for travel time to set, note it here. Find out from your line producer if this is necessary, and how production would like it recorded. Time In: This is the time the person arrived at the set. Time Out: This is the time the person left set. Overtime: The number of hours and minutes that this person worked past their budgeted day. Check with your line producer, as each production may have a different contractual structure for how overtime is defined. Explanation for OT: If overtime is due to anyone, production will want to have a reason for it. You needn’t go into the details. A simple word or phrase to describe the reason for the OT. If there is more to say, save it for the comments section at the end of the production report. Time sheets may inspire some de ja vu, because most of the same information overlaps with your call sheet. By having your call sheet on hand, you can easily glean cast and crew travel information, call times, and objectives for what they had to accomplish. In StudioBinder, you can actually track when cast and crew received their call sheets, when they viewed them, and when they confirmed their call via a click. Congrats! You’ve made it through the front of the production report template! Now, flip it over - there’s an entire backside to fill out, too! The first step is to fill out the project header again. You might be tempted to skip this, but don’t! Although the daily production report format is meant to be double-sided, these reports get photocopied onto single-sided pages. So you want to make sure each page identifies the project and shoot day. The “Appearances” section is where you note any depiction releases (aka talent release forms) you filled out over the course of the day. Hopefully, your cast has completed paperwork by the time production happens. But not always. Background talent often fill out their paperwork on-set. Sometimes a production pulls people off the street to be extras in a scene. Those extras must all fill out depiction releases before they’re dismissed, and those releases can be noted here. If any releases are missing, it’s important that you note that here. Production needs to know if there'd be any trouble down the road with clearing footage. Location Releases should be completed before production. But in the event that production secured a location release on the day, this is where location releases are noted. The next section in our daily production report template is the Payments section. Often, during the production day, small things have to get purchased or paid for. In this section, all those small purchases are recorded. In this section of the daily production report, note the number of meals that were consumed. Caterers on larger productions typically charge per person. On smaller productions, where caterers might provide an informal ‘buffet-style’ meal, the catering section might not apply. Record the meal times under IN and OUT. Record the total number of meals ordered for the day. For Plate Count, you’ll need to physically count the number of people eating. A reliable way to do this is to stand at the catering line and count how many people pick up a plate. Note which Caterer supplied food that day. Some productions get food from multiple caterers, so it’s important to keep track. The Substantials section is where you note what ‘substantial’ food items were offered between meals. These are not your typical craft service items. These are prepared snacks to help your cast and crew get through the period between meals. They are usually offered by Craft Services, but are occasionally provided by the caterer. Every variation of the daily production report format should have a comments section. This section is where you explain anything that impacted the efficiency of the day. Any unusual circumstance that might have caused delays. This is also the section where any injury or insurance claim needs to be properly listed. Insurance adjusters will often request a copy of the daily production report when a work-related claim is being investigated. It is important to list every injury. Sometimes an injury will appear to be minor, but complications may develop later. Don’t let a crew member tell you ‘it’s no big deal’. If it happened on set, it needs to be listed in the daily production report. Answer those questions briefly, but thoroughly, here. Even if there were no obvious repercussions, try to notate anything unusual. For example, even if an actor arrived late, but you caught up and wrapped on time, it’s still should be noted. See where it says On Set Representative? Make sure your AD and UPM are comfortable with the document. Sign above that line to affirm the accuracy of what you’ve recorded once all changes have been made. Get the production manager’s signature on the next line. Then deliver the form to the production office. You’re done! A production report is often filled out by the 2nd Assistant Director, but it must be approved by the 1st AD (1st Assistant Director) and the UPM (Unit Production Manager) or managing Line Producer. Successful productions implement a handoff system to ensure that two people aren't working on the same section of the daily production report at the same time. The handoff can (and is usually) digital in the form of an email. In film management software, like StudioBinder, you can assign tasks to your ADs and UPMs, attach drafts of your production report, and use the comments function to check in remotely. The daily production report helps producers keep track of money and resources. It is a black-and-white record of how on-time and under-budget the production is. If your daily production report shows that significant portions of the crew had to work more hours than expected for the day, the producers know they need to make adjustments to future shoot days to keep the film from going over budget. If your shooting schedule called for five scenes and you only shot two, the producers know there’s a problem. You’ll either need to catch up on future days or do some serious re-thinking about the schedule. A DPR is a legal record of production. You will archive it in the production wrap binder and keep it for the life of the film. This is why it’s important to fill out the daily production report accurately, and to have a unit production manager or line producer sign off on the details. 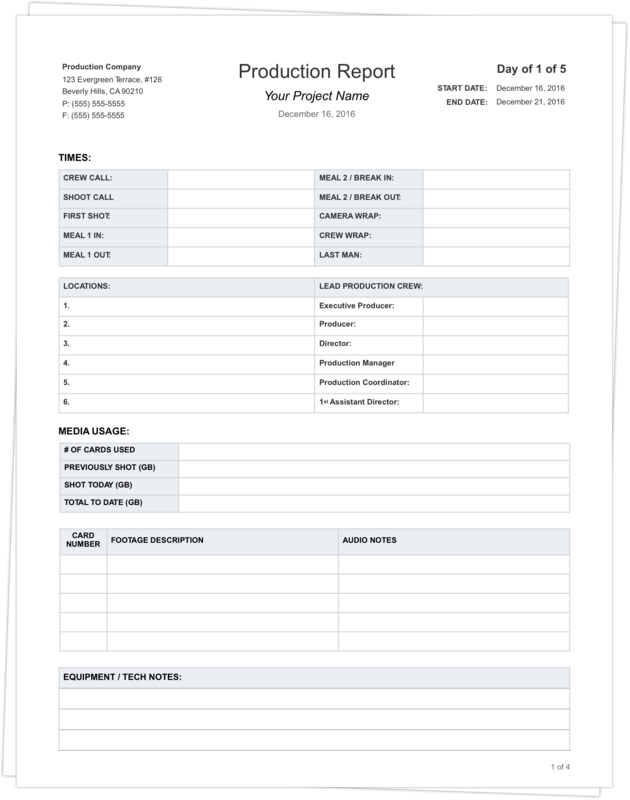 Our production report template is one of many possible configurations that you might encounter, so make it your own. The ultimate goal is to communicate useful information about the shoot back to the production office, whatever those needs may be. Ultimately, the best form to use is the form that production approves. And with StudioBinder, making a report is easier than ever. Ready to get started? Here’s the free Daily Production Report Template. Feel ﻿free﻿ to edit it to suit your production’s needs.